On the last day of the Wings Over Houston airshow, hung out with Doug on the north end of the runway. Thanks Doug. Got some good close-up photos that I’ll post later. The moon was out and we tried to get photos of the planes flying near the moon. Didn’t realize that I had captured this photo until I got home. It’s a WWII Grumman Avenger torpedo bomber. This entry was posted on October 25, 2015 by Tim Timmis. 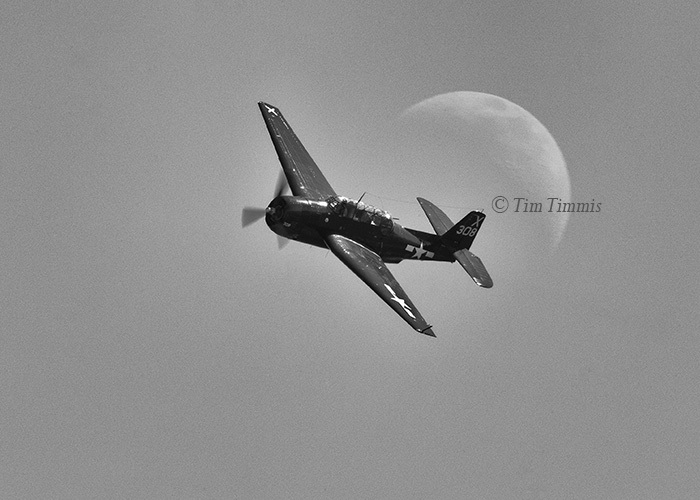 It was filed under Airshow and was tagged with Canon 1.4x III, Canon 1DX, Canon 500mm F4 IS II, Grumman Avenger, moon, Wings Over Houston. Well I’m glad someone got that shot. Trying our best to just get sharply focused and properly exposed photos with all that fast action, it was hard to see if they were passing in front of the moon. It would be a chance shot in this case and it paid off. The moon certainly adds something extra to the shot. Glad you got some “keepers” from the hill. It was a pleasant surprise when going through my photos that I captured this one. Glad that I was able to spend time at each end of the runway and inside the gates. Had all angles covered. Thanks Sheldon. I’ve had lots of practice over the last 10 years on these prop planes.